InfoSafe is your complete secure information management software for Palm OS® handhelds, Pocket PC or Windows Mobile handhelds, and Windows PCs! Keep track and organize usernames, passwords, website logins, ID numbers, serial numbers, software codes, insurance info, bank accounts, credit cards, calling cards and much more. 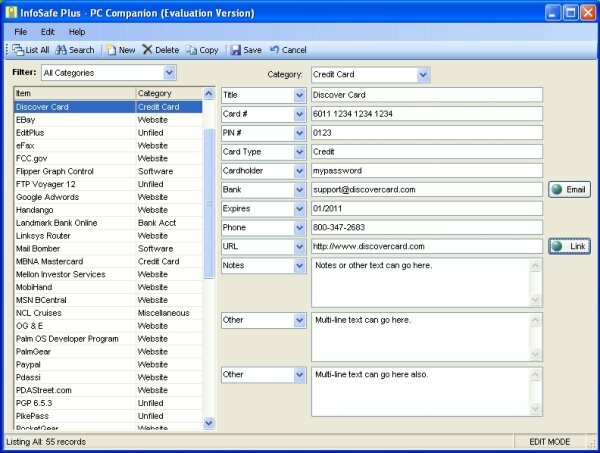 Import - Export Items - import and export items to and from comma or tab delimited files! Easily import your existing database. Store ANY Data - Store usernames, passwords, logins, websites, insurance information, identification information, account numbers, credit cards, calling cards, combinations, email accounts, frequent flyer numbers, memberships, prescriptions, serial numbers, utilities, vehicle information, voice mail codes, warranties, and MORE! Password Protection - Choose your own password to prevent unauthorized access to your data. The password is not stored on the handheld or PC, so no one else will be able to retrieve it. Data Encryption - Records are encrypted with 128 bit encryption for security. Customizable Fields List - Customize the fields list. Change any field name for any record! User Definable Categories - Assign a category to each record, and you can filter by category. We provide a starting list of categories, but you can add and delete category choices to fit your needs. Optional handheld software included for Palm OS and Pocket PC.